We were just in Atlanta for an EV test drive that we conducted for the Southeastern Association of Regulatory Utility Commissioners (SEARUC). We had a great time, and send a warm shout out to our friends at Plug In America, the Southern Alliance for Clean Energy, and City of Atlanta Mayor’s Office of Resilience. 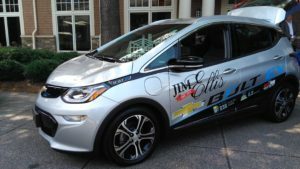 Jim Ellis Chevrolet offered the only Chevrolet Bolt in the state of Georgia for the SEARUC event. Georgia treated us well. Dealerships from around Atlanta participated including Jim Ellis Chevrolet, Telsa of Marietta, Athens BMW, United BMW, and Nissan North America. We had 80+ degree temperatures, that wonderful mugginess that reminds you that you are in the Southeast, and a busy test drive line full of first time EV drivers. As always, we received overwhelmingly positive feedback about the cars and the exciting directions ahead for clean transportation. The sidebar conversations were about how to get more people into EVs, ensure that all people can find their place in this new market, and continued acknowledgement of the important role for policymakers and regulators in speeding the transition to electric transportation. Until 2015, Georgia had one of the most robust state tax credits for EV purchases and, as a result, has one of the highest EV adoption rates in the country. As efforts coalesce to revive some measure of state support for EVs, a key question comes up for policymakers – how do we know that everybody benefits when one person decides to drive electric? How can we measure the public benefit as we consider allocating public resources? The Atlanta metro area is famous for its traffic. As with any gridlocked city, massive traffic brings commute headaches and air quality issues. The nine-county Atlanta metro area has a longstanding challenge meeting US EPA air quality standards. As of 2000, the area was ranked by the American Lung Association as the 9th most polluted in the nation for ozone. The Southern Alliance for Clean Energy reminds us that in Atlanta the biggest source of the chemical that causes ozone pollution – nitrogen oxides – are tailpipe emissions from cars and trucks. Though things have gotten better recently, snarled traffic, too many cars, and that famous muggy weather mean that in any given week the Atlanta metro is an air quality warning waiting to happen. Fulton County in the metro still clocks in with 9 unhealthy days for ozone per year. As the 1996 Olympics approached, one can only imagine the concern for the Olympians that might soon confront that muggy soup of poor air quality. Given that motor vehicles account for 50% of the air pollution in urban areas, city and Olympic officials made a concerted effort via traffic controls to reduce vehicle use and congestion across the metro during the Games. The efforts paid off – peak morning traffic decreased 23% and weekend peak traffic went down 10%. The benefit for air quality? Peak ozone levels were cut 28%. In reviewing that data afterwards, researchers discovered that during the same period emergency visits for asthma events in children decreased 42%. The New York Times reported that asthma-related care for HMO enrollees fell by 44%. Citywide hospitalizations for asthma decreased by 19%. The only public health indicators that changed during this period were those that correlated to the cleaner air metro Atlanta garnered due to traffic controls during the Olympics. At the time, researchers were left with the reflection that, while the 1996 Olympics experiment certainly demonstrated the health benefits of clean air for children and asthmatics, it was unrealistic to think they could persist. Certainly more mass transit and fewer car trips would correlate to cleaner air, but one couldn’t fathom metro Atlanta imposing permanent traffic controls. But one can fathom an Atlanta metro area that has 20% or more electric vehicles. That penetration would likely correlate to the kind of 20% reductions in air pollution that Atlanta saw when it imposed those traffic controls in 1996. That penetration, combined with Atlanta’s ongoing efforts to cut down on cars, provide for a walkable and bikeable city, and offer good mass transit options for all would likely mean even fewer bad air quality days for Atlanta and fewer still asthma attacks for kids and less duress for the people who care for them. If anybody ever asks you if EVs are good for everybody, just ask them if they’ve heard the story about the 1996 Olympics.